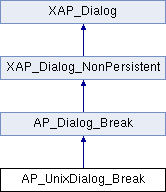 References abiDialogSetTitle(), AP_Dialog_Break::b_COLUMN, AP_Dialog_Break::b_CONTINUOUS, AP_Dialog_Break::b_EVENPAGE, AP_Dialog_Break::b_NEXTPAGE, AP_Dialog_Break::b_ODDPAGE, AP_Dialog_Break::b_PAGE, XAP_App::getStringSet(), XAP_StringSet::getValueUTF8(), localizeButton(), localizeButtonUnderline(), localizeLabelMarkup(), XAP_Dialog::m_pApp, m_radioGroup, newDialogBuilder(), s, and WIDGET_ID_TAG_KEY. References m_radioGroup, UT_ASSERT, and WIDGET_ID_TAG_KEY. References m_radioGroup, UT_ASSERT, UT_SHOULD_NOT_HAPPEN, and WIDGET_ID_TAG_KEY. References _findRadioByID(), AP_Dialog_Break::m_break, and UT_ASSERT. References _constructWindow(), _populateWindowData(), _storeWindowData(), abiDestroyWidget(), abiRunModalDialog(), CUSTOM_RESPONSE_INSERT, AP_Dialog_Break::m_answer, m_windowMain, and UT_return_if_fail. Referenced by _constructWindow(), _findRadioByID(), _getActiveRadioItem(), and AP_UnixDialog_Break(). Referenced by AP_UnixDialog_Break(), and runModal().